Travel is stressful enough already. Add the challenge of used sharps disposal on a plane, bus, or secluded mountaintop and… Wait, that’s not stressful at all! Our travel-size sharps tubes go where you go and are there when you need them. They’re a portable, compact, secure, and affordable way to safely contain your used syringes and other sharps waste while traveling or even when out shopping. Carry a travel-size sharps tube in your backpack, purse, or briefcase. After you self-inject or test your blood, place the used sharp in the travel tube. Dispose of the entire sharps travel tube at a safe location – a sharps collection kiosk, disposal container at an airport or other public restroom, or in a home sharps disposal container (like our Sharps Recovery Systems). The travel tubes are designed for one-time use, to reduce the possibility of accidental needle sticks. For safety, once the lid is locked, it can’t be reopened. Dispose of the tube either in a larger sharps disposal container or as you would any other sharps container. Preferably, do not throw the tube in the regular trash since many states do not allow such disposal even by home users. Check with your state for proper disposal of home-generated sharps containers. The FDA recommends that used sharps be “immediately placed in a sharps disposal container.” Our transport tubes are FDA-cleared and made of puncture-resistant plastic with a tight-fitting cover. If you carry unused syringes or sharps on planes and expect to use them while in transit, be sure to follow TSA guidelines for used sharps in carry-on luggage. Our travel-size sharps tubes meet FDA and TSA requirements. They come in cases of 7 tubes so that you won’t run short unexpectedly. Remember that TSA may require special screening for sharps and medication. Consider keeping your medications and supplies easily accessible for easier screening through airport security. Who Should Carry A Sharps Tube? Transport tubes can be used on the job by trained employees in addition to providing sharps disposal containers in restrooms for use by self-injectors. Sharps are also found on playgrounds and other public places. 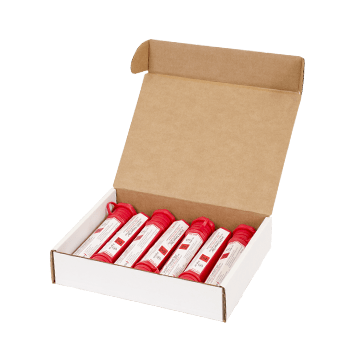 The travel-size sharps tube is an easy-to-use sharps collection container for city workers and police officers working in the field who have been instructed in syringe containment and removal.